Oh how I love this card!!! SweetStmaps has some of the most amazing Rose images in the store. This one, Rose Oval is the newest addition to my collection. Colored with copics and a bit of glitter glue added to the wings of the butterfly. I also used the new SweetCuts die, behind the rose image. Really love the look that it gives the entire card. Overall the card is very simple, but I kept it that way to keep the focus on the roses. Love it! I like the colors you used and the black die cut. This is beautiful!!! I LOVE the paper in the background! Your roses go with the paper so perfect. Wonderful card. Love it ! Hugs. Lovely card, I like the way you used that die, wonderful background for your roses. Beautiful play on color! Love the BG DP and the accent of the dies- and love your coloring!!! 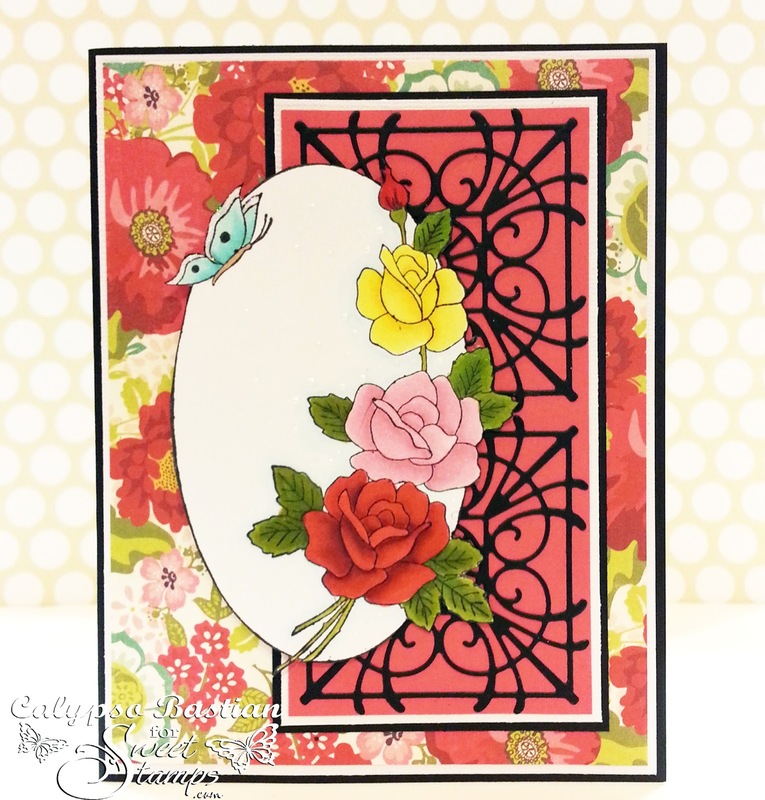 Gorgeous card, I love the bright DP you used and the coloring and shading on the Rose Oval is beautiful. Love the contrast of the black Flourish Medallions behind the image. Beautiful work Calypso!! I love how the black silhouette stands out against the lovely colors you chose! Love the medallions behind the rose image an the layering behind the medallions. Lovely card ! Really Bright Colors ! Tks for joining the Bright Colors Challenge at the House of Gilli Blog. Simply beautiful, gorgeous flowers and colours. Thank you for joining in the That Craft place challenge this time.